If looking to trade in the chaotic city life for a much quieter, country one, check out this new listing for a farmhouse in Rotterdam, New York. 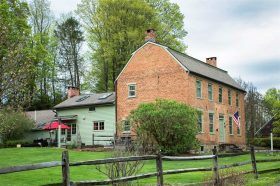 The Georgian Brick Colonial at 322 Wemple Road, known as the Delamont-Wemple Farm, was built around 1760 and is featured on the National Register of Historic Places. As Curbed learned, the home, sitting on over 60 open acres, includes a custom pool house, four bedrooms, three bathrooms and many fireplaces. And it’s on the market for $1.1 million–less than most tiny NYC apartments.